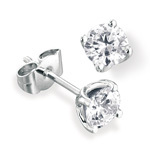 Diamond earrings are an ideal gift to match a woman’s diamond engagement ring or as a gift to a special loved one. 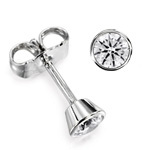 Choose from diamond stud earrings or fabulous drop earrings that make a statement day or night. Earrings are clearly one of the most popular types of jewellery on the market so it’s hardly surprising that Mad About Diamonds have the most comprehensive range on the UK online market. Our white and yellow gold diamond earrings are truly spectacular and are sure to make any lady sparkle. They serve as a great accompaniment to any of our diamond engagement rings or can be worn whenever you are dressing to impress. As with all of the products in the Mad About Diamonds range you can custom make your diamond earrings entirely and choose from several materials and effects. 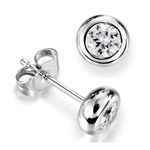 From drop diamond earrings to fabulous studded pieces - the choice is yours. The jewellery is made in our splendid UK workshop as well so you get the added peace of mind that is provided. 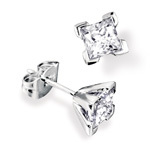 If required we can make any of our designs in 950 platinum or if you wish we can make diamond earrings to your own design. Just call our friendly staff to discuss your requirements. White and yellow gold diamond earrings from Mad About Diamonds suit any dress you wear as you can have single or solitaire approached or even a range of coloured gems, princess cuts and sapphires. Opting for diamond earrings does not mean you lose any of the benefits that our diamond rings provide - they are crafted with the same level of care and expertise. 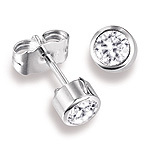 All of the Mad About Diamonds earrings are made with only the highest quality diamonds and metals so you get amazing quality across the board. Don’t forget to get in touch with one of our specialist staff if you have any queries about any of our great diamond earrings. 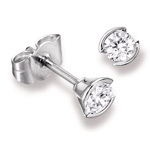 Purchase your Earrings online from Mad About Diamonds. 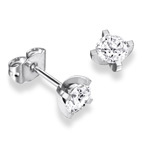 Our personalised service will ensure you get the best possible deal on your Diamond Earrings!